Enimala Ggopal is excited. Ignoring the scorching sun, he runs from one plant to the other. He has planted 160 mango saplings on his land. “Come, see this,” he calls out to his wife, Yerramma, scooping out some wet soil from underneath a plant. Gopal had never imagined in his wildest dreams that he would be able to grow a fruit orchard on his parched land. His village Madiguba falls in the Anantapur district of Andhra Pradesh, which remains forsaken both by the monsoon and government’s irrigation facilities. The government has categorised the district as a desert. So like many other farmers in the region, Gopal had allowed his one hectare to remain fallow for years and somehow pulled through by working as a daily wager under the Mahatma Gandhi National Rural Employment Guarantee Scheme (MGNREGS). “Early this year, for the first time, we harvested a tonne of tomatoes. If these mango saplings survive and grow into trees, our struggle will come to an end,” Yerramma says with a hearty smile. 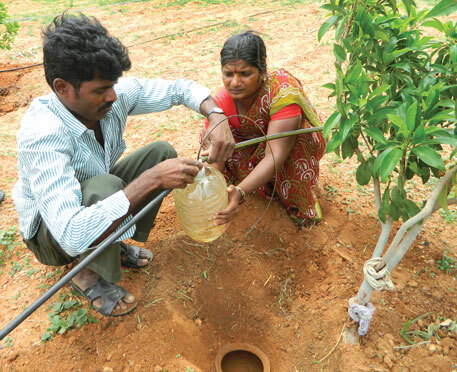 What has come to the aid of the family and other farmers in Anantapur is a technology, System of Water for Agricultural Rejuve- nation (SWAR). “We developed SWAR to help the millions of small and marginal farmers in arid regions who fail to grow anything due to lack of water and electricity,” says K S Gopal, director of Hyderabad-based non-profit Centre for Environment Concerns (CEC). The conventional micro-irrigation system (which involves drawing water from the source, say a bore well, and dripping it onto the soil at very low rates) has definitely reduced water requirement by one-fourth compared to flood irrigation. But it does not work in areas where water is scarce and electricity supply is unreliable. For instance, explains K S Gopal, one-third of water gets evaporated in micro-irrigation system. Since there is no way to know whether plants have received sufficient water, farmers, at times, use up the entire water available in bore wells. Excess water only leads to weed growth. SWAR does not require electricity, and uses only one-tenth of the water required under flood irrigation by assuring that the soil around the roots remains moist. “The concept of SWAR is holistic,” says Balaji Utla, a researcher at CEC. It involves harvesting rainwater and making it available for irrigation. Rainwater is collected in a small tank, lined with clay at the bottom and sides to prevent percolation. It is kept covered with plastic sheets to check evaporation. Water is then pumped to an overhead tank using a pedal pump. From there, water flows to each plant under gravity. Water flows through a PVC pipe attached to the overhead tank and gets collected in five-litre moulded and ultra-violet resistant plastic jars placed next to each plant. These jars are kept embedded in two-and-a-half litre earthen pots that remain buried in the soil. Water drips into the earthen pot through a hole at the bottom of plastic jar and from there it seeps into the soil. The cap of the plastic bottle is fitted with a filter to strain impurities and a T-knob to regulate water flow. It remains above the ground so that the farmer can monitor it. “Using SWAR, we need to water once in a week for 15-20 minutes,” says Sakke Narayana, a farmer from Garudempalli village in Anantapur. He has planted 180 trees, including mango, guava, lime and custard apple on his less-than-one hectare land. “We do not have to spend hours watering the plants. This is very easy,” says his wife, Ramanjanamma. CEC advises farmers to enhance the level of microbes in the soil so that moisture spreads fast. “Apart from providing nutrients to the plant, microbes till the soil by moving around,” explains Om Rupela, who was a senior scientist with the International Crops Research Institute for Semi-Arid Trpoics and is associated with developing SWAR. 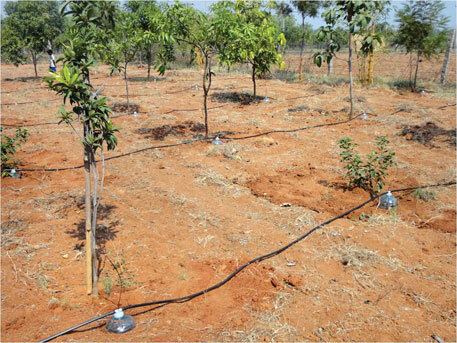 “This creates capillary action for moisture to spread around the roots.” So far, 4,000 fruit-bearing trees have been planted using SWAR in Anantapur in Andhra Pradesh; Nalgonda in Telangana; Osmanabad in Maharashtra; and Sehore in Madhya Pradesh. Is it really for small farmers? While farmers who have adopted the technology are happy, many non-profits working with small and marginal farmers say it may not benefit all. The Installation cost of SWAR dependson the number of trees on the farm. For an orchard of 200 plants, installing SWAR along with rainwater harvesting and storage infrastructure will cost about Rs 300 per plant. “Marginal and small farmers can ill afford it,” says Y V Malla Reddy, director at Accion Fraterna Ecology Centre in Anantapur. All farmers using the technology have received support from various non-profits who bought the technology from CEC on experimental basis. CEC installed the system for free on Enimala Gopal’s farm as a demonstration project. “NGOscan support only a few farmers, not all,” says Reddy. K S Gopal is hopeful. “SWAR costs much less when compared with flood irrigation. A lot of money is being spent for horticulture development and water conservation under MGNREGS without desirable results,” he adds. In Andhra Pradesh (before bifurcation), every year the government was setting up orchards on 60,000 ha of dry land under MGNREGS. These orchards were watered by 5,000-litre tanks attached to a tractor. Given that mango orchards require 40 rounds of irrigation a year, the government spent Rs 90,000 a year on watering a hectare of dry land-turned-mango orchard. The government would have spent Rs 3,500 a year using SWAR technology, says K S Gopal. The technology would also have helped save a significant amount of water and money spent on electricity subsidy. 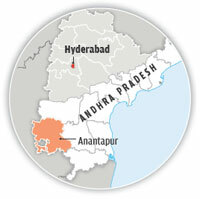 It is estimated that the Andhra Pradesh government spends about Rs 21,250 on electricity subsidy for helping farmers irrigate one hectare. Three years of subsidy money that the government disburses towards irrigation is sufficient to provide the SWAR system to all farmers in the state. “If the Centre and the state governments promote SWAR, more farmers can adopt it and a lot of water, electricity and money can be saved,” says Utla. Apart from using SWAR for growing fruits and vegetables and enhancing green cover in arid regions, the technology can be very well used in growing a good number of trees in degraded forest land, says K S Gopal. One can transfer the system to other spots once the saplings have grown. Sir, This sounds very interesting. We are interested to know more and have detailed information for use in the hilly tribal area in Pune district. Regards, anand kapoor, Shashwat. Hi, If you wish to know more about SWAR please do get in touch with us through email. We can be contacted at swartechnologies13@gmail.com. SWAR is indeed a commendable innovation for a "desert" like zone. The good thing about the initiative is the emphasis on soil nutrients through microbes and soil organic matter. But the ultra-high elasticity being imparted to comparing a desert-like zone with flooding system is not the best strategy. The critical phase for SWAR will be when it is examined with reference to ensuring food security of the marginal and small farmers. In functional terms, it is the role of SWAR in staples that will set it on the pathways to sustainability. But the simplest way is to grow care-free growth,regenerative and CAM plants like Agave and Opuntia in millions of hectares of wastelands for biofuel/biogaspower/biochar. Mexico is pioneer in this. These being CAM plants will act as Carbon Sink. I have had been advocating this the Union and State Governments but no action. Crassulacean acid metabolism, also known as CAM photosynthesis, is a carbon fixation pathway that evolved in some plants as an adaptation to arid conditions. In a plant using full CAM, the stomata in the leaves remain shut during the day to reduce evapotranspiration, but open at night to collect carbon dioxide (CO2). The CO2 is stored as the four-carbon acid malate in vacuoles at night, and then in the daytime, the malate is transported to chloroplasts where it is converted back to CO2, which is then used during photosynthesis. The pre-collected CO2 is concentrated around the enzyme RuBisCO, increasing photosynthetic efficiency. A very good suggestion. Seems both Central and State governments have not taken your suggestion seriously. Sir, can you please share your mobile number ? Also please paste a link if your articles on this subject are published online. Iwant to go through it in depth. My email.Id srinivas5955@gmail.com. Cell no is 077299 19197 or 094447 12199. This sounds quite interesting to me. We're trying to develop orchard in Jharkhand comes under ACZ-VII (the semi arid zone of central India) through MGNREGA. If you kindly send us more detail write up about the technology (SWAR) it would definitely help a large no. of small scale farmers who don't have any hope from their non-irrigated soil degraded upland! A revolutionary approach which will help farmers in drought areas like Anantapuramu, Mahaboobnagar and other places in India. Solution suggested by Dr. A Jagadeesh need to be taken seriously by policy makers.